The Skinny: Better-than-average thriller that's unafraid to surprise its audience, but doesn't do so without becoming implausible. 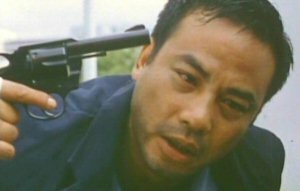 Simon Yam gets the award for worst cop of the year. by Kozo: Simon Yam stars as a cop on the trail of a mysterious killer/biker who kills women on Friday. Somehow, he enters into a bargain with the mysterious "Friday Killer." Here’s the deal: if Simon stops the killer from offing Maggie (Loletta Lee), then Simon wins. But if Maggie is snuffed, then the killer gets to kill Simon’s family in return. Despite the obvious crappiness of the bargain, Simon is game. Then, in one of those suspension-of-disbelief moments, Simon doesn’t even bother to send his family elsewhere. He just plays along, as the killer begins showing him up by taking out other people. His wife (Ada Choi) gets scared and her marriage to Simon goes on the rocks. That’s okay though, cause Simon decides to cheat on his wife with Maggie. Too bad that the Friday Killer finally decides to off her. Can Simon stop him in time?